I would echo the hearts, and do feathers in the strips and borders. I love your quilt top! What a great idea for a scrappy baby quilt! Yes, I agree with erstan947. In addition I would SID all the vertical seams enclosing the strips, and then SID every 3rd or 4th strip. Hearts in the borders would be nice too. This is a beautiful quilt, one that will be adored! No help with quilting ideas, just to say "Adorable Quilt!!" SID down the long panels. Echo the applique hearts inside and out. SID below the first bar. Skip 2 and SID again. This will create a box you can stitch a heart in. It will make the heart quilting offset from each other. This sounds really cute. Love your quilt!!! Bright and cheerful quilt....I am no help on the quilting! Have you already appliquéd the hearts or just fused them on? If not, make the quilt sandwich, then stitch in the ditch for your straight lines, and appliqué stitch each heart. It helps to have a busy-print backing with matching thread so you don't see the stitching as much. When I appliqué I often do it last as the quilting, depending, of course, on what the project is. Sew sweet! Echoing would be my choice around the hearts then the rest maybe feathers or stars along the borders. SITD for the interior rectangles. Adorable baby quilt, love scrappy. Maybe echo the hearts and then SID on vertical seams and then two straight vertical lines fairly close together down the middle of the strippy panels. A very, very SWEET quilt. I would quilt once arounr each rectagle and once around each heart. Hearts in the border. Now that I have read all of the responses I see that many people have the same idea that I have. Can't wait to see it completed, please post when done. How cute!! I would echo inside and outside of the hearts, and loops with hearts down the rows & borders. 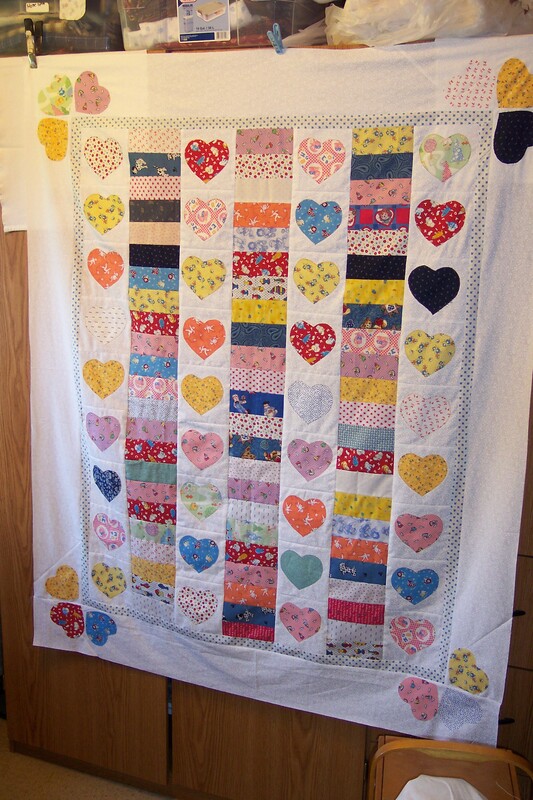 Lovely quilt - I would SID on each side of the strips, then quilt around the hearts. You could do a simple "X" cross-hatching, starting at the first strip on the left, then stitching across to the third strip on the right side, then continuing in the cross-hatching. Hope I made that clear. You could do hearts, feathers, whatever you like in the pieced strips, anything would look great. I like what was suggested, but I think in the white border my quilting would extend what is going on in the rest of the quilt. You know that feeling when you've finished all your quilting projects and your studio is perfectly clean???? Me neither. It's not how fast you sew, it's how well you sew fast! Wait, I think that's supposed to be MOW!